So you made it to magnificent Italy only to find that *gasp* it’s freaking hot. Typically, the hottest months of the year in Italy are July and August (but in the last few years the weather has been anything but predictable, so it can be hard to judge). Before getting here, don’t simply gauge things based on the degrees listed on the forecast as the humidity present adds a whole nother dimension to heat perception (which can be hard to fathom until you’re here to experience it firsthand). Hydrate, hydrate, hydrate! Seriously, when it’s this hot you can’t get enough water. Keep in mind that in Italy water fountains are plentiful just about everywhere you go so you can easily top up your water bottle. Do yourself (and our planet) a favor by getting yourself one of these insulated stainless steel bottles (we have them and they’ve become an MVP item in our family!). FYI: It’s safe to drink from fountains in Italy unless you see a sign that says acqua non potabile posted nearby. Having a spritzer or a fan is like a piece of heaven. Just being able to mist yourself with some water will help cool you off. And those elderly Italian women have those fans for a reason. They help. A lot. If you get on the train and it feels like a cattle car, keep on walking until you find a car where the air conditioning is working. This applies, in particular, to the regional trains (like the Cinque Terre Express) where finding a car with properly functioning A/C is hit and miss. 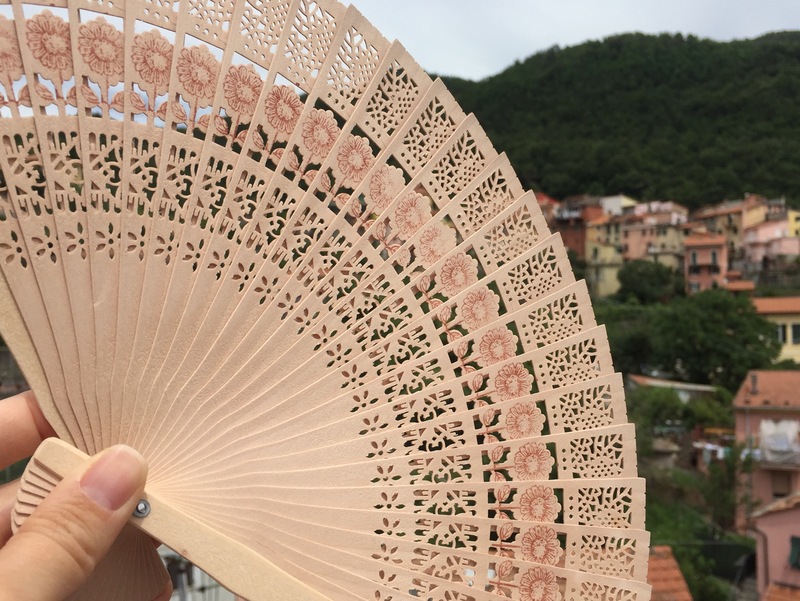 If you’re staying in a place without A/C (yes, lots of places in Italy don’t have air conditioning) ask for a fan. And if it’s sweltering hot, do what the Italians do and take a cold shower right before going to bed. It’s amazing the difference this makes! Head to the seaside or to the mountains where you can cool off. Visiting the art cities (like Rome & Florence) in August is a bit eery as they are essentially void of Italians who have all made an exodus to cooler locales. If you can tolerate the heat, however, it’s actually a relatively crowd-free time of year to visit the inland cities and their museums. Counteract the heat by eating lots and lots of tasty gelato (as if you needed me to remind you of this). 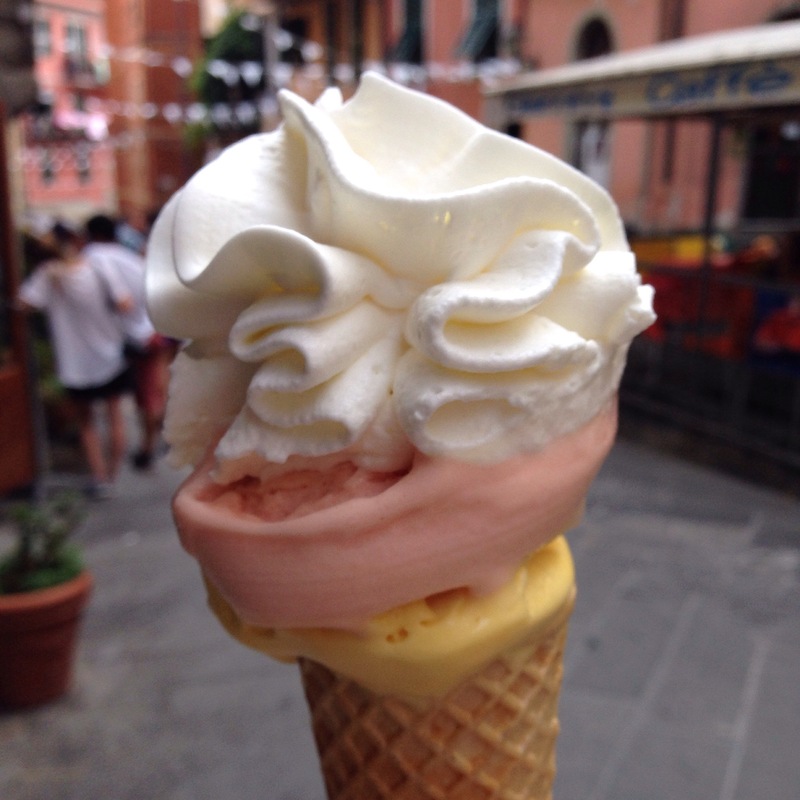 Gelato makes everything better, trust me. *This post includes an affiliate link. If you make any Amazon purchases by clicking through the product link above you’ll help support the hosting and upkeep of the blog. Grazie mille! 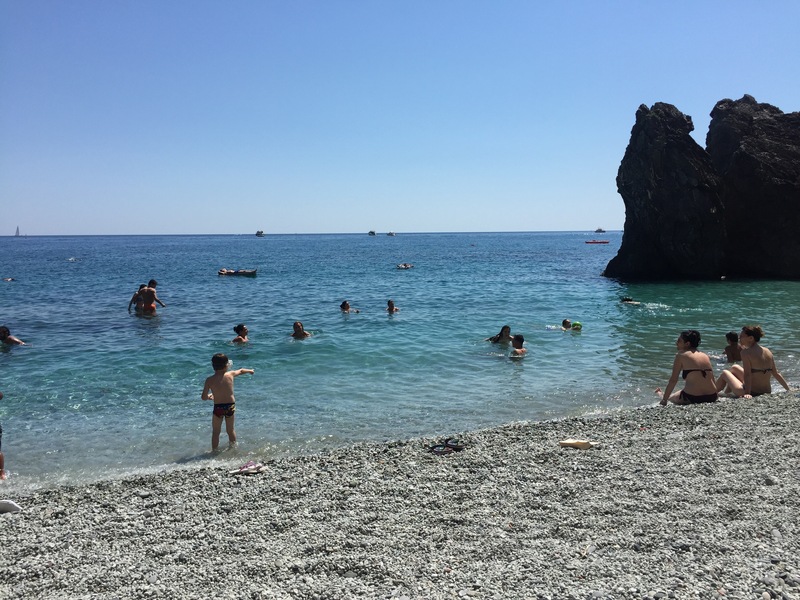 Can you tell me is the beach picture in this post the Bagni Eden Beach Club in Monterosso Fegina? If so, which beach has the smoothest sand? 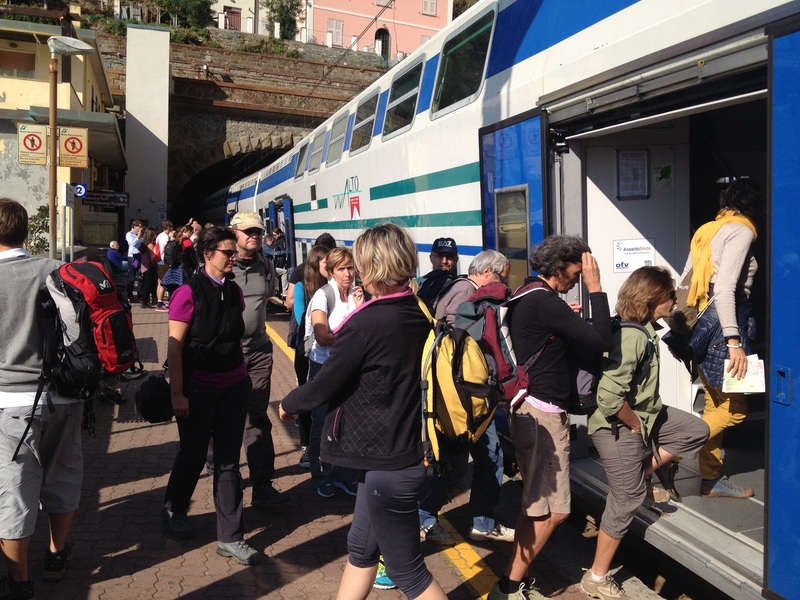 Also, since the weekly train pass is no longer available we will be buying the 2 day Cinque Terre Card with trains. Is it just as easy to get it at the TI in Monterosso or would it be better to buy it online and bring it with us? Any news on Via d’ell Amore opening by September? Thanks Again! Yes, the photo pictured is of the stretch of beach in Monterosso that belongs to Bagni Eden. Stella Marina has sand (but the water won’t be as pristine as the sand makes it a bit murkier). It’s no problem to buy the Cinque Terre Card in Monterosso. Last I checked it still wasn’t possible to purchase those cards online. Sorry, no chance whatsoever of the Via dell’Amore being open this September.